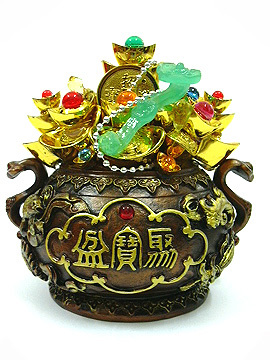 This special wealthpot is specially designed with its pot engraved with "8 Auspicious Objects" to make it a Period 8 version as recommended by our Feng Shui Scholars. The 8 Auspicious Objects would bring complete good fortune, material luck, spiritual growth, peace, confidence and genuine happiness in your wealth accumulation and make it last for as long as 20 years in Period 8. The special objects will also signify protection of your wealth from harm and prevention of loss, besides amplifying your good fortune. 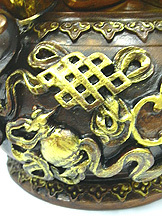 The wealth pot has gold ingots, jewellery, the Ru Yi sceptre and treasures spilling out of the pot to signify abundance. This item is specially catered for those who have higher ambitions of making more money and would like to leapfrog higher and higher to gain more material success throughout Period 8. You may place this at your cash register or your office and wealth areas to amplify your fortune in Period 8. 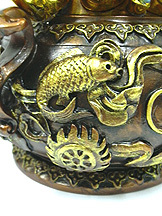 Meanwhile the Eight Auspicious Objects signify excellent luck. The mystic knot magnifies fortune for Period 8, the conch provides good communications and travel luck, the canopy provides protection against bad energy, the vase is for abundance, the wheel represents success and improvement, the double fishes represents material gains, the lotus for peace and the victory banner symbolizes accumulation of successes.